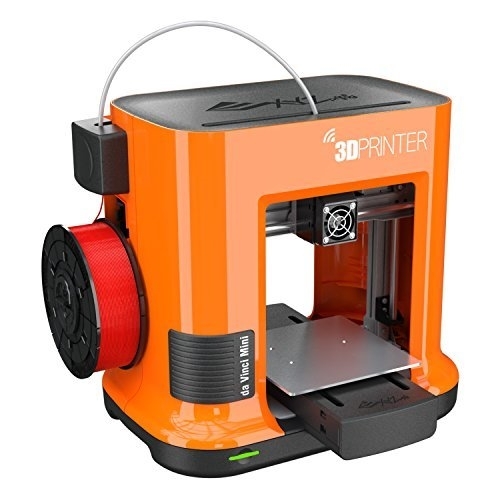 Description: The da Vinci Mini comes with several features that are often associated with much more complicated 3D printers like embedded Wi-Fi, which allows users to transmit files from their computers to the machine over Wi-Fi. It also has onboard data storage, which allows makers to upload object build files via USB, then walk away as the machine constructs it! The da Vinci mini uses proprietary PLA filament. You can only use XYZPrinting filament designed for this range of printers, as other PLAs will clog the da Vinci. The XYZ filaments are made using PLA plastics derived from corn starch, making them biocompostable and non-toxic, they are also tested extensively and are guaranteed to be DEHP-free and heavy-metal free. This filament is safe for the environment and children. Our printer comes with at least one roll of filament, and you can order extra when you reserve online.